Just came back from my FLGS (Game Vault) where they have a copy of the upcoming Planetary Missions book. While I'm not in the rumor business or keeping up with the latest news, I thought I might share some of my thoughts after taking a few minutes to thumb through the upcoming book. 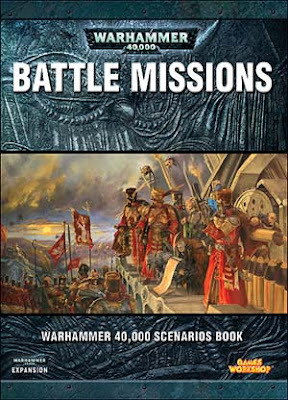 If you are a "competitive" player and like a good, fair fight between armies, this book may not be for you. If you're looking for more of a story or narrative approach to your games and don't mind one side having a distinct advantage or two, this book is for you. If you're looking to see how your army stacks up to other forces, these missions are not the ones to play. I can see where they slant to one side sometimes. There's nothing wrong with it, you'll just need a certain mindset to really enjoy this book. There are 30 "Army Specific Missions" and 3 additional "Special Missions" at the end of the book. They give you a couple ways to choose missions. If you can't figure out how to do it on your own, they outline a few different ways to go about it. It's broken down into a chart that can be rolled on for ease. There are a handful of new deployment layouts. Some of them use the short edges of the table too, not just the long edges. A feature I noticed right off the bat was that they clearly define the "table edges" for each army in their respective deployment zones. Nothing new here, it looked like most games had the random length just like the standard missions do now. There are a few in each mission. Like I said before, if you're looking for an even fight, these missions may not be for you for this very reason. I can see some of these making it a real challenge to play. These are NOT crazy new rules, but things like granting Fearless, Stubborn, Night Fight, etc. 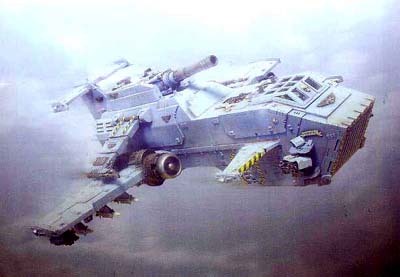 And wouldn't you know it, one of the Space Marine missions allows the Marine player to field a Thunderhawk as part of his force. And then there are the 3 Special Missions in the back. This is a chance to really get in there and convert that squad of unique models that you always wanted to build. They give you the FOC and all that stuff to play squad on squad. Designed to allow one player to take a single Apocalypse formation and play against another player fielding equal points of regular (non-Apoc) models. They use 3 Baneblades in the example mission, but you can substitute anything you want in there. Hero vs. Hero. You get points for each enemy model your Hero kills. The player with the most points at the end wins. Only a Hero can kill the other player's Hero, so your Commander will not die unless it's at the hand of the other player's. All in all, it looks like a really nice book. I know that I'll be picking one up for myself as I've come to enjoy the story and narrative type gaming more than the standard battles. Don't get me wrong, I actually like those, but I like some of the unfair fights I can see coming out of these missions. Had a flick through this at the club the other week, and a few days ago and in all honesty I'm looking forward to it. In the club there are many competitive 40k players 9mostly Fantasy guys) so being able to play some different missions for a laugh will be a good crack I think. It actually sounds like a lot of fun. Might be the first of those supplements I'll actually pick up! Kill Team and the Hero thing sound particularly interesting. I was with Draz when he flicked through the book, must admit, there's some great ideas in there. I love the flutter down artillery bombardment. This is one book I will be picking up. I got to flip through it at my local GW today, and was quite intrigued. I mainly looked at the pics and read the thunderhawk scenario. Planning on meeting up with a friend and playing some of the scenarios when it comes out. The more I hear, the more excited for the book I am - I mostly play for fluff and fun, so the missions sound like they're right up my alley. I'd imagine with a bit of creative juggling many of the 'army specific' missions may be perfectly playable with alternate armies as well... Sounds like it's going to be a must-have book for my gaming group!